Every year he wants an ice cream for his birthday. Unfortunately, he is usually on his birthday in Iraq... but not this year! He is home this year and I wanted to make his super special ice cream by doing it myself. He ordered a Butterfinger ice cream! Although, a little bit of time (it took 2 days)... the final product was really worth it! 1. Place half a liter of ice on the counter, at least 45 minutes before you start to soften it. You want it to be partially melted, but not completely liquid. 2. Preheat the oven to 350 degrees Fahrenheit. Spray the bottom of the container onto the spring jig with non-stick spray. 3. Combine has broken cookies with sugar. Add the melted butter until all Graham biscuits are moistened. 4. Press the Graham cookies at the bottom of the pen-shaped tray. You want to make about 1/4 in the cortex. You may not need the whole mix. Save the rest for another recipe! Bake for 12-15 minutes or until golden brown. Allow to cool completely on a rack. 5. Prepare your ice cream after the crust has completely cooled down. In a large mixing bowl, mix half a liter of soft ice cream with at least 1/2 cup of crushed Butterfinger. 6. Remove the second half gallon of ice to soften. 7. 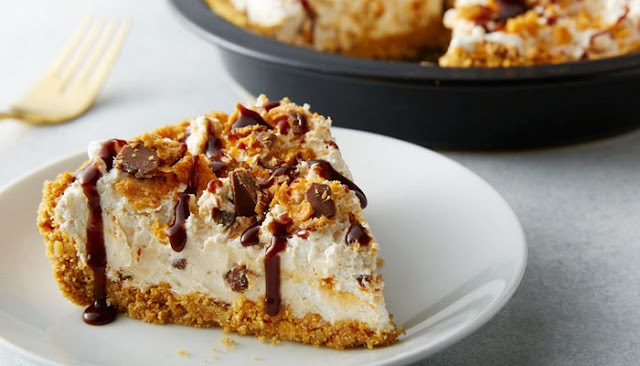 Spread all Butterfinger ice cream over graham biscuit crust. 8. Save 1/4 cup of remaining butter finger to cover. Spread the remainder evenly over the Butterfinger ice cream. Pat it down carefully on the ice. 9. Place the spring tray in the freezer for 20-30 minutes or until the ice is firm. 10. Sprinkle the vanilla ice cream after curing until it fills the pan. Cover with plastic and freeze overnight. 11. Prepare the whipped cream icing by whipping the whipped cream with the beating batter in a standing blender for a few minutes. Gradually and slowly add the vanilla and sugar when you start to beat. You will know what happens when the texture is thick and fluffy. 12. Apply a thin layer of cream to the top and sides of your cake. I used a large star point to make a decorative border around the top edge. 13. Sprinkle the remaining Butterfinger on top. 14. Freeze for 1 hour or until use. You want the whipped cream to be solid. 15. Remove the cake 15 minutes before serving. When I'm alone with adults, I always add a generous spoon to these bean-beer cocktails. These ice cream sandwiches are not only for the National Ice Cream Month, but also perfect for a summer meeting, a birthday party or even a family reunion. Oh yes, they are melting... fast! So you do not go with your picnic, but if you have a barbecue in the garden, they are ideal. Remove this ice cube from the freezer for 5 to 10 minutes before serving and then take it out. Off. Where the ice is dripping on Johnny's face... and the grass. In fact, there is a good way to eat these Butterfinger ice creams. First, you want to lick all the ice creams and try Butterfinger for the first time. The cookies need a while to soften, so lick this dreamy natural vanilla ice cream until you can nibble at the edges of the cookies. At some point you can have a bite to eat, but I think it is more fun to nibble on all sides until the ice melts again and then lick it around. First, you have to make cookies. I recommend using my favorite recipe for chocolate cookies, which I did. You can use yours, but you probably have to duplicate them and make huge cookies. My recipe already has that in mind. Just follow the recipe, except that you want to replace Binger Butter Binger pieces of 1 ½ bag (15 Oz) for chocolate pieces / pieces. For your information, I went ahead and added this recipe with chocolate chip settings in the printable version below. Remove the 2 ice cream cups from the freezer to soften them slightly. Meanwhile, mix your cookie dough with 15 ounces of Butterfinger Back Bits. Reserve the other 5 us to roll your finished ice creams. Align the jelly box with parchment paper that overlaps on all sides. Put the ice cream in a large bowl and stir in the way you used to when you were a child. Pour the bowl with soft ice cream into the lined mold and spread, spread and spread to a smooth mass. Place the tray in the freezer until the signatures of the ice return for about 2 hours. If you do not have a kitchen scale, it is a really good investment and they are pretty cheap. I use mine constantly and weigh almost everything. It is the best way to distribute food evenly! You will notice this in the video above... I recommend that you weigh most of your cake when you're done mixing. Divide this sum into grams by 36. If you measure the dough and use the same weight for each cookie ball, you will be rewarded with 36 beautiful cookies from this recipe.